→How Do You Measure Your Stride? Using a Pedometer is one of the devices that records the number of steps you take to help you reach your best performance. Usually, you would need to measure your stride. How do you measure your stride? Is there a relationship between having a lengthy stride and increasing running speed? How can you increase your running frequency? We’ll explain the best way to measure your stride in this article. How Do You Measure Your Stride ? Before we give you the three easy ways to measure your stride, let us first define your stride. Your stride length is the distance between the heel strikes of the same foot. ​The step length is the distance between the heel strike of one foot and the opposite foot. The two are often interchanged so it is important you understand what you want to measure. Your running stride has a great influence on your running speed. For this reason, you need to learn how to increase stride length in order to run faster. In fact, runners can increase speed by not only increasing their stride length or increasing the frequency of their steps. Successful runners do not only focus on one of these two but are able to increase both stride length and frequency. We’ll go into more detail about these two techniques below. Well, we have already differentiated between stride length and step length. There is another factor that will help us understand the difference between stride length and speed namely, cadence. Cadence is defined as your walking rate. It is measured by the number of steps you can take in a minute. In order to calculate your walking speed, your cadence is multiplied by your step length. One of the major factors that contribute to your running or walking speed is the relationship between your stride length and your energy use. Your stride length is directly related to the energy you burn during your walk or run. This being the case, if you have a good stride length, you will be able to conserve energy more. This is one of the fastest ways to measure your stride but is not that accurate. The way to do this is different depending on gender. For men, you will need to convert your height to centimeters (1 foot is 30.48 cm) and then multiply this by 0.415. For women, multiply it by 0.413. Generally speaking, men have an average stride of 78 cm and women 70 cm. Whatever the result is, round it off to the nearest whole number and you get your stride length. If you don’t mind being a little inaccurate and simply want the fastest way to measure your stride, then this is a good method to use. This is a more accurate option that you may prefer if you want the nearest to truth numbers. There is no difference in method whether you are male or female, the steps remain the same. First, use one pen as your starting line placing it on the floor. With the other pen in hand, walk ten steps. Then, place your other pen behind your heels on the tenth step. Next, use a tape measure to determine the distance between the two pens. Divide the distance by ten to find your stride length. Then Pedometers automatically calculate your stride length. This is not an accurate estimation but if you don't' have time to calculate your stride with the above methods, then it may be a good option. The only problem with this method is that not all pedometers offer this feature. If your pedometer doesn’t have this feature and you want an instant answer, you may opt to use the average stride for men and women mentioned earlier. Count how many times that foot strikes the ground each minute. Then multiply that by two. To increase the length of your stride when running is a totally different approach to increasing stride length when walking. When walking, you would simply reach further in front of you to attain a bigger stride. The bigger risk of injury. When you are running, you are putting a lot of pressure on your muscles unlike when walking. Reaching further in front of you may reduce the efficacy of load absorption and cause injuries. The higher chances of heel striking. If you reach out in front of you when running, you are jamming your leg in front of you at a higher speed. This may in time result in a locked knee or heel. A better way to increase stride length is to increase the distance you cover while in the air. This is also called your flight time. This can be achieved by improving your hip extension. You can find some great hip extension exercises here. ​The second way to increase your running speed is to increase your step frequency. This basically means the rate at which you take steps. This may seem as easy as simply moving your legs faster but there is much more. In order to increase your cadence, you need to increase your aerobic capacity. You will also need to modify your running form. Some useful videos can be found here. 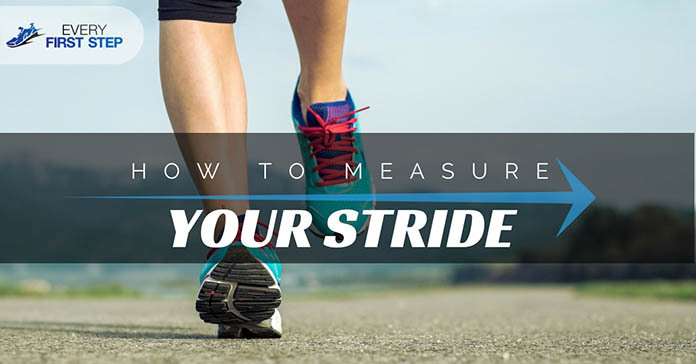 Learning how to measure your running stride is the first step to determining how to increase your running speed. Now that you understand the relationship between your stride, energy conservation and running speed, you will be better equipped to tailor your workout for optimal results.